The QCD approach was originally developed to help companies within the British automobile sector. Using QCD can clarify the priorities for improving the production processes in a company. The tools in the QCD approach can be used to assess the results of changes in production processes. They can be used as an instrument for rapid feedback which provides the actual facts and figures for the management to make meaningful decisions. With the gathered data it is furthermore possible to set goals for the future and fulfill continuous reports. To analyse the business processes of a company with the target of increasing the profitability there are seven steps which have to be considered. 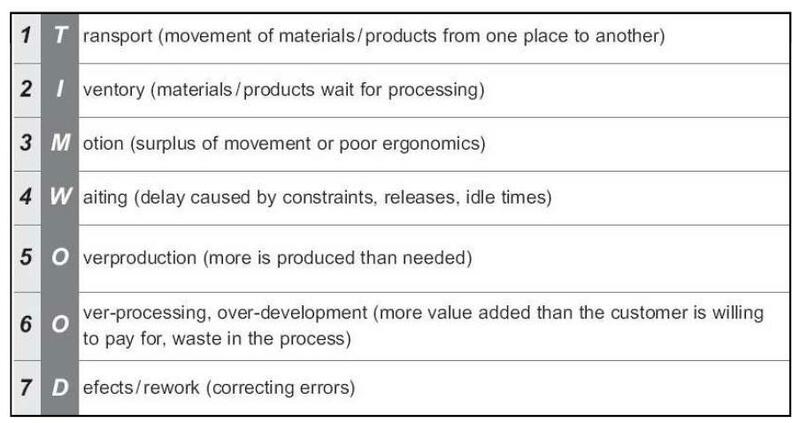 These seven key measurements offer a clear structure for continuous improvement, raising levels of customer satisfaction and improve the management of the whole production processes. They can be applied to improve production performance throughout manufacturing industry from the auto-industry to electronics, aerospace, telecommunications, textiles, building products, food and chemicals processing. be multiplied by 10^6 to get the number of parts per million. parts on every thousand, this transforms into 4.000 parts per million. deliveries of the wrong quantity (too many, too few). focus on a major product cost, the staff salaries. Stock Turns (ST) is defined as the ratio of current stocks to finished goods. ST ratio reveals how effectively the company is using funds. funds to invest in other parts of its business. availability, performance efficiency and quality rate. There are three key points to look at: availability, performance and quality. then the performance is running by 50%. quality is running at 50%. employees, those who are vital to the production process. required to assemble one MP3-Player. the expense of acquiring or leasing new buildings. necessary to divide the turnover by the amount of space which is used. Another important method used during our project is Value Stream Mapping (VSM). It is a tool which was implemented in the Japanese automotive industry and is commonly used in lean continous improvement programs. It helps to understand and improve the material and information flows within firms. The main aims of creating and discussing VSM’s is to eliminate waste along the value chain and improve the understanding of the different production steps by visualising. 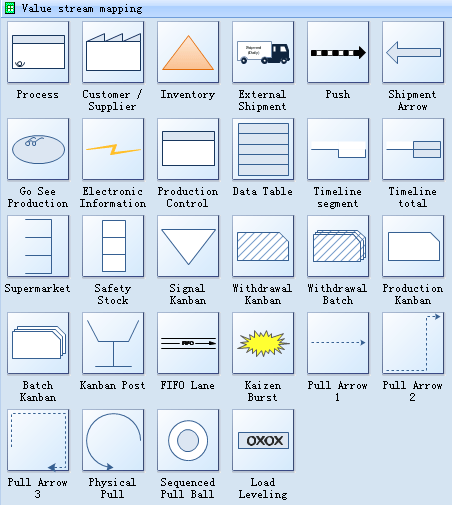 VSM is an important tool for companies in order to become lean and it presents the whole production process of a product from ramp to ramp. It could imply attributes associated with the steps of the process like the size of batches, the amount of queue time and wait time, the processing rate, the scrap or yield rate and the cumulative processing time. It’s usually created with the Microsoft application MSVisio 2007. Chase, Aquilano, Robert Jacobs (2005), Operations Management for Competitive Advantage,p.473. Novak (2006), The small manufacturer’s toolkit, p.135. Lunau, Roenpage, Staudter, Meran, John, Beernaert (2006), Six Sigma + Lean Toolset,p.147. As said in the post ABC-Analysis, i am going to provide you with useful methods in the as-analysis phase of layout improvements. Spaghetti diagrams are used to improve the performance of processes by identifying and minimising non-value-adding activities. Value is defined as aspects of a product the customer is willing to pay for. To create a Spaghetti diagram the performance of a number of workers, products and lifts is recorded and measured. Every actual movement and every step of their work will be displayed in the general map of the production area. The highest priority by accomplishing a Spaghetti diagram is that the actual process flow gets visualised instead of how it should be. Furthermore it is a snapshot in time so it does not include every possible scenario. Lunau, Roenpage, Staudter, Meran, John, Beernaert (2006), Six Sigma + Lean Toolset, p.138. To enrich the qualitiy of my post i decided to present you some useful methods which i learned about during my product project. The ABC-Analysis is an instrument which allows the classification of different products regarding their contribution to the corporate turnover. It is based on the Pareto Analysis which is also known as the 80/20 rule founded by Villefredo Pareto in the nineteenth century. It points out that 20 percent of the effort is repsonsible for 80 percent of the results. 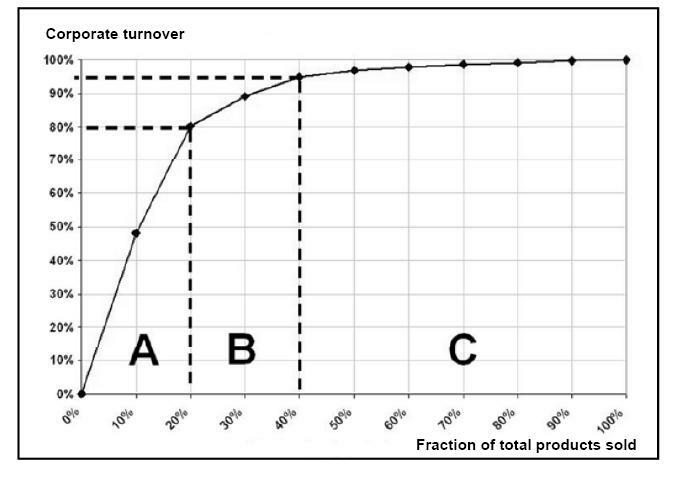 According to this rule 20 percent of the products are generating 80 percent of the turnover. But the ABC-Analysis differs to the original Pareto Analysis regarding the fact that the products are subdivided in three different segments. Chase, Aquilano, Robert Jacobs (2005), Operations Management for Competitive Advantage,p. 610. Prokopenko (1987), Productivity management, p. 130. Wannenwetsch (2006), Integrierte Materialwirtschaft und Logistik, p. 77. When each member of a group in a supply chain tries to maximize his or her own benefit without regard to the impact of other members of the group, the overall effectiveness may suffer. Such inefficiencies often creep in when rational members of supply optimize individually instead of coordinating their efforts. A well known example of such inefficiency in staged supply chains is the bullwhip effect. This effect refers to the tendency of replenishment orders to increase in variability as one moves up the supply chain from retailer to manufacturer. A lack of coordination may even outweigh the benefits from specialization and economics of scale. Therefore it can be said that the bullwhip effect is the key example for supply chain inefficiency. So the bullwhip effect is near-hand term for a dynamical phenomenon in supply chains. The Barilla company, a major pasta producer located in Italy provides a demonstrative of issues resulting from the bullwhip effect. Barilla offered special discounts to their customer who ordered full truckload of their goods. Such marketing deals created customer demand-patterns were highly peaked and volatile. The supply chain costs were so high that they outstripped the benefits from full truckload transportation. The Barilla case was one of the first published cases that empirically supported the bullwhip phenomenon. Demand signal processing is the is the practice of decision makers adjusting the parameters of the inventory replenishment rule. Target stock levels, safety stocks and demand forecasts are updated in view of information or deviations from targets. Another major cause of the bullwhip problem is the lead-time, which is caused by two components. The physical delays and also delays in cause of information. The lead-time is a key parameter to calculate safety stocks. The third bullwhip creator is the practice of order batching. Economies of scale in ordering, production set-ups or transportation will quite clearly increase order variability. The fourth major cause of bullwhip is highlighted by Lee has to do with price fluctuations. Price discounts and quantity discounts are often offered by retailers. So the retailers buy goods in advance and quantities and store them. This do not reflect their immediate needs. The fifth cause of bullwhip is connected with rationing and shortage gaming. Inflated orders placed by supply chain occupants during shortage periods tend to boost the bullwhip effect. Werner, Hartmut (2008), “Supply Chain Management”, Gabler. Disney, Steven M.; Lambrecht Marc R. (2007), “On Replenishment Rules, Forecasting, and the Bullwhip Effect in Supply Chains”, Publishers Inc. Definition: Fleet management comprises the target-orientated, optimal planning, supervision and control of the fleet operations based on the available resources, considering internal and external influencing factors. A special focus is on the integration of organizational processes with modern information systems. TSP = Travelling Salesman Problem -> find the shortest way of a circular tour that is as cost effective as possible and that visits a certrain amount of customers exactly once. Fleet management in former times was more about buying/selling/repairing of cars. You didn’T buy a car BRAND-new but buying it when it had 20.000 km for example because it’s more cheaper then. There were different policies how/when (in which step of the product lifecycle) you buy your “fleet”. -> Necessary due to the fact that international transportation is a risky business (standards got defined to handle different cases [who is taking the risk, who is the owner]). These standards defining different cases are called Incoterms, set some ground rules for international transactions and get revised every 10 years.